Gift card, also known as gift certificate or gift voucher, is a prepaid stored-value money card usually used in depositing money on a store online’s account of customers. Gift cards are issued as an alternative to cash or credit cards to purchase products within a particular store. The amount of deposited money in the gift card is granted indefinitely and they can not transfer from one account to another or purchase another gift card. Magento 2 Gift Card extension is a useful extension for online stores. The extension offers magnificent features that allow admins to create unlimited virtual/physical gift cards with a full control over templates; the price of the gift card and the value of purchases; gift codes and discounts; conditions of use; expiration and display locations. 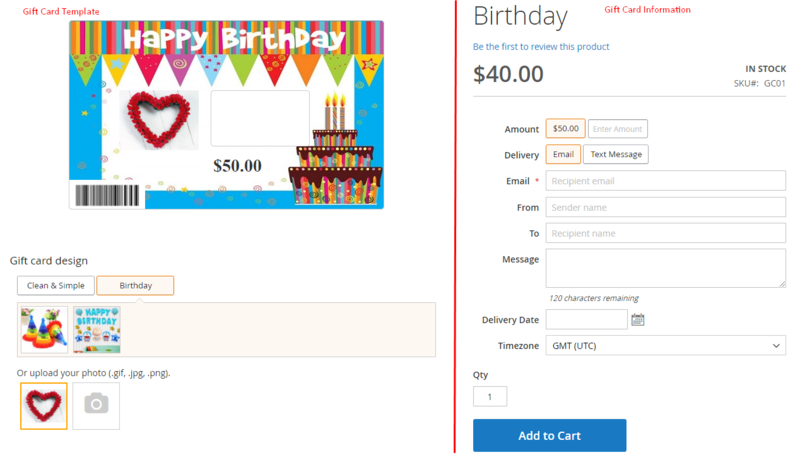 Moreover, it’s really flexible for gift card users to create their own card templates, track and manage their sent gift certificates. In addition, buyers can take advantage of the basic and advanced features of gift cards. Furthermore, Gift Card extension allows store owners can send to their customer via emails, SMS or Post Office. They can also subscribe to receive notifications when a Gift Card or a Gift Credit changes. In View Cart Page: Customers can use available Gift Cards, Gift Cards in the Saved List or Gift Credit as a discount on the order total. 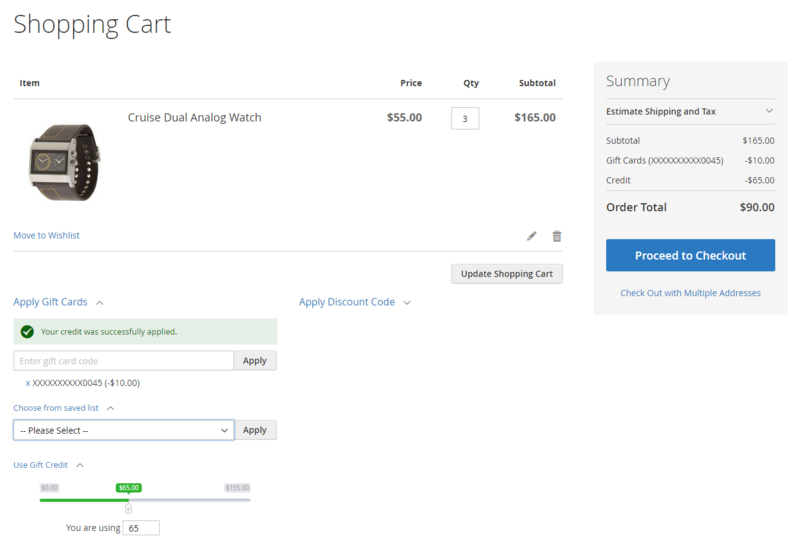 In Checkout Page: Similar to the View Cart, if the customer wants to change the Gift Card or Gift Credit, they can also edit in the last step. Admins can generate a new Gift Card Product, manage Gift Code, Gift Code Pool, Template, History as well as set up the extension’s configuration. 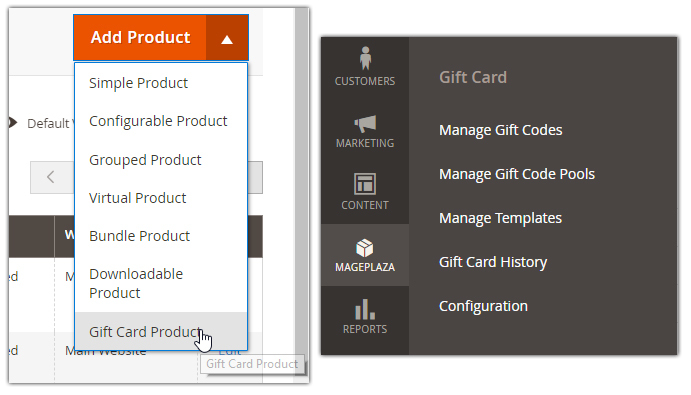 At Mageplaza > Gift Card: Configuration to have an overview look in the extension’s general configuration. In the Module Enable field: choose “Yes” to turn the module on. In the Gift Code Pattern field: Is the common pattern of generated codes. 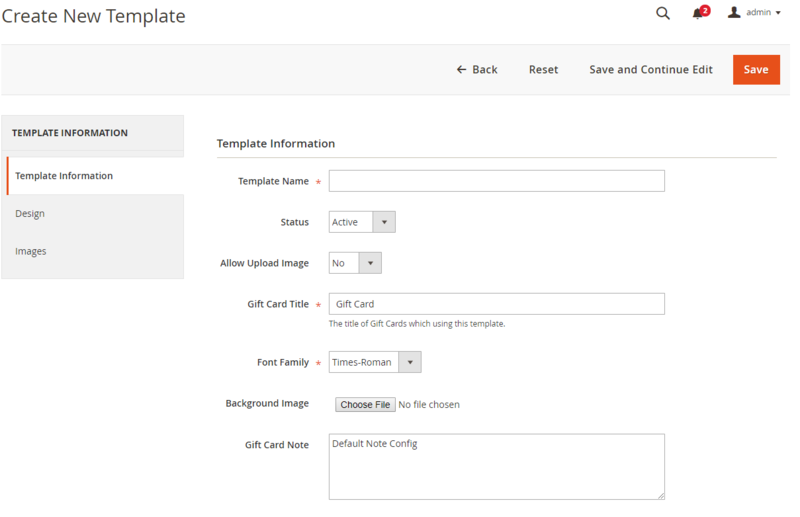 When creating a Gift Code or a Gift Code Pool, admins can change this template as their desire. In the Enable Gift Card Credit field: Select “Yes” so the customer can use their Gift Card. Then Gift Card Can Be Redeem section will be displayed. Only visible when admin set Enable Gift Card Credit = Yes. Allows a gift card to be redeemed. The amount of a gift card after being redeemed will be added to the customer’s gift card credit. If you leave it blank, nothing will be displayed. In the Gift Card Lifetime field: It’s the place to set the expiration date of a gift card purchased by a customer. Select “Yes” to display Delivery Date on the frontend Gift card Product page. This also allows the customer to choose the gift card delivery date as they wish. When you select “Yes”, Customer Can Select Timezone section is displayed. When you select “Yes” in this section, customers can change the timezone according to the choice based on the given List Timezone. 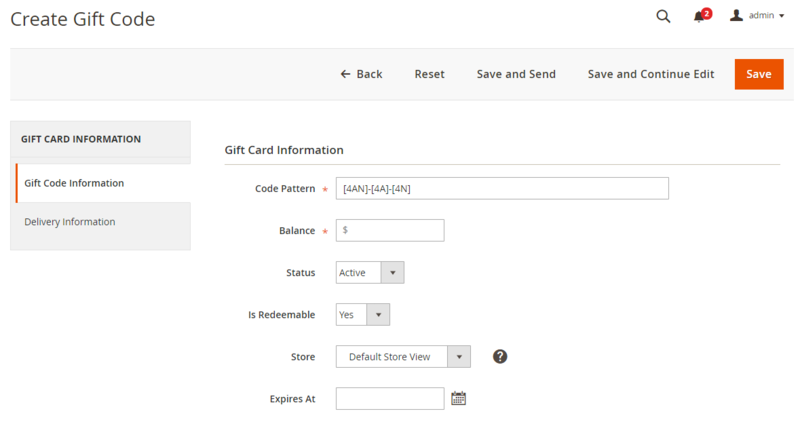 This section allows admin to setup the display of the components of a Gift Card in the View Page. You have to choose at least 1 option. If you don’t, this won’t be saved. 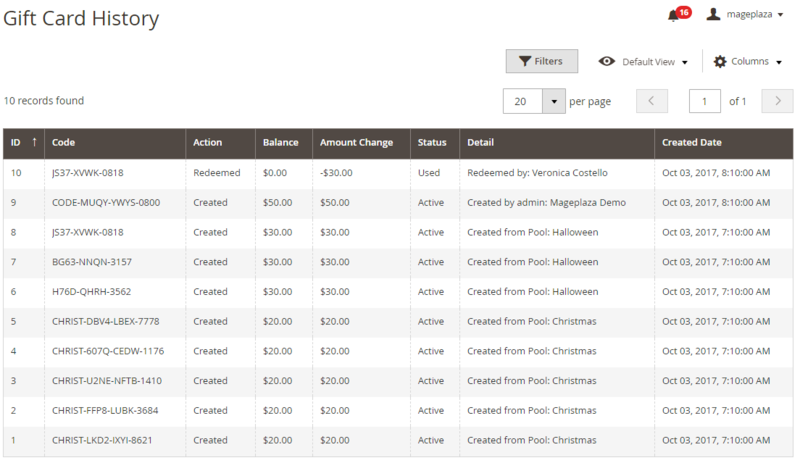 When Invoice Created is done successfully, a gift card of customer will be generated automatically. On the frontend, the customer can apply a single Gift Code only. So does admin when creating New Order in the backend. If there’s only Gift Card Product in the Order, when the Gift Code is applied, there will be an error message. 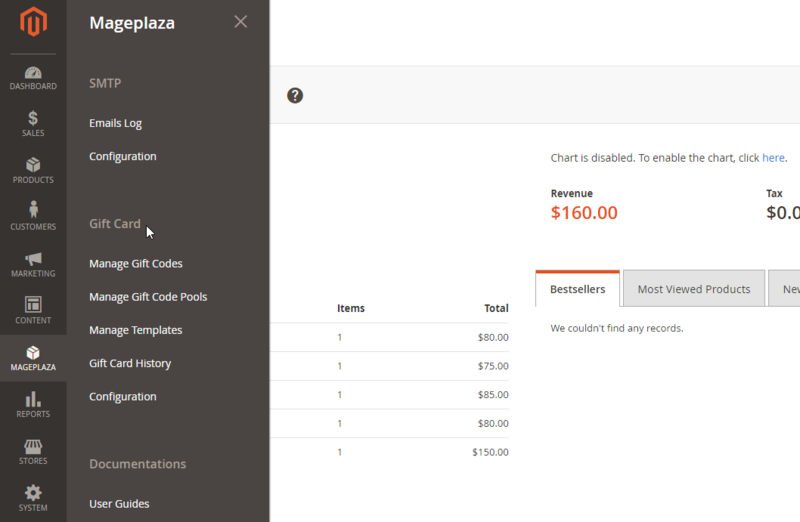 On the frontend or in the backend, Magento’s default Coupon Box will be used to apply the discount. If there’s only Gift Card Product in the Order, the Gift Code will not be displayed. If you select “No” in Use Coupon Box To Apply Gift Card part, this section will be displayed. Choose “Yes” to allow customers can use multiple gift cards at the same time. The Gift Code is displayed entirely depending on whether admins use Hidden Code Configuration or not. In the Can Use For Shipping Amount field: Select “Yes” to apply a gift Card and gift credit for the shipping fee. If both gift card and gift credit are having sufficient value and the customer doesn’t purchase Gift Card Product, the order can be considered as a free one. In the Allow Refund Gift Card field: Select “Yes” to be able to refund the amount of a gift card or gift credit to customer’s balance. In the Logo field: Choose your own store’s logo. If a logo is already included in the Template, then it will be applied on customer’s gift card. 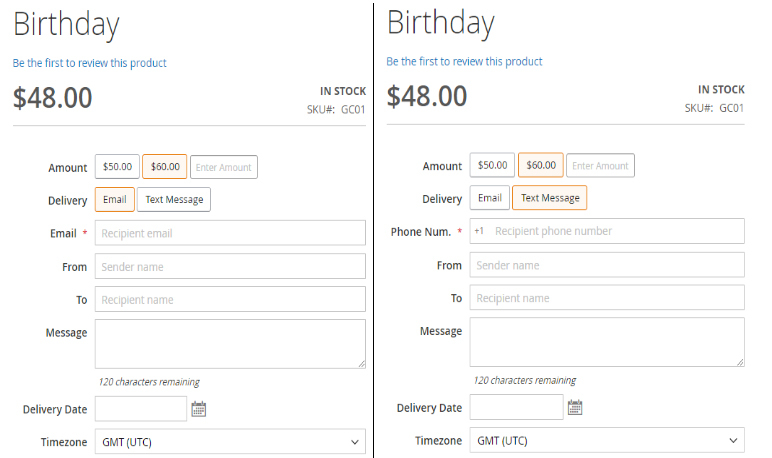 Set the number of character that customers will enter in Message on the Gift Card Product’s frontend. If admin leave it blank or enter 0, the maximum number of characters will be automatically restricted to only 120. When admin creates Template in Manage Templates, this can also change Default Note. In the Enable Email Notification section: Choose “Yes” to enable the function and “No” for the vice versa result. When a gift card arrived to recipients perfectly, an email containing the gift card will be informed back to the sender. Another small extra for the email configuration, is provided for updating email actions. In the Enable field: Choose “Yes” to turn the function on. Another extra module for the email configuration, is provided for notifying the expiration via emails. Expiration day will be configured in the below section. This expiration day(s) also applies for SMS sending method. 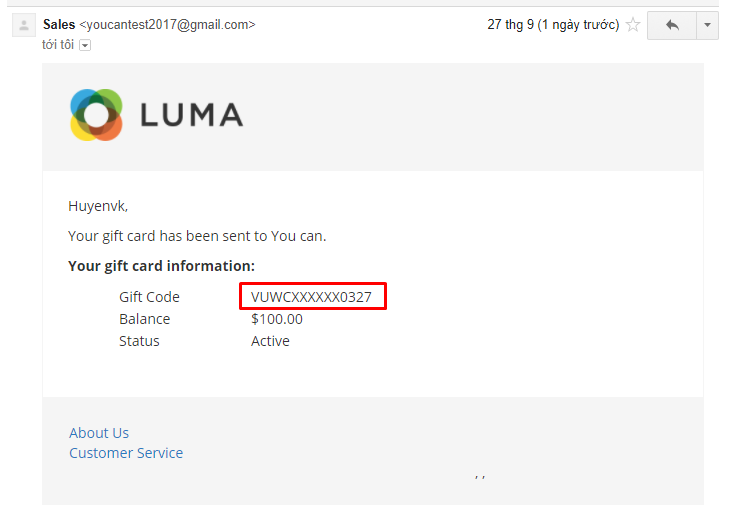 Another extra add on for the email configuration, is provided for notifying the recipient after sending gift cards. Select “Yes” so the senders can receive an email confirmation that the gift card they gave to the recipient has not been used for X day(s) since it was sent. Unused X day(s) will be set up in the below module. The activating gift card is generated from an order. In the Enable field: Select “Yes” so that customers can receive emails every time the balance of a gift credit is updated. In the Enable SMS Delivery field: Select “Yes” to allow the system to send SMS about the gift card message to customers. 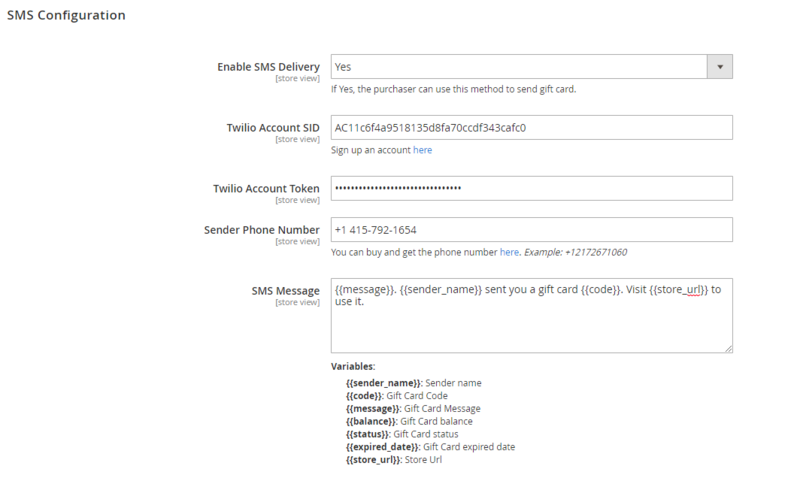 In the Twilio Account SID: Admin needs to register a Twilio Account, use the SMS sending method to enter the correct SID of his Twilio Account. In the SMS Message field: This is where the admin modifies the content of the SMS before sending it to customers. Admin can use premade variables to add a SMS text. Choose “Yes” to receive a gift card SMS message informing how many day(s) left to use their gift card. Select “Yes” to let customers receive a SMS message informing how many days to use their gift card. In the Message field: Admin can use pre-made variables in the above box to change the SMS content. Delete: check template(s) you want to remove, then choose “Delete” in the Action box (at the left side of the Grid). Click “OK” to confirm the delete action. Change Status: check template(s) you want to apply, in the Action box, select Change Status > Active/Inactive to change selected template(s) status. After entering the Manage Template page, you can select the redCreate New Template button to create a new template. After clicking Save and Continue Edit, the page will automatically switch to the Edit Template page. In the Status field: Select “Active” to display the template on the Gift Card Product Page frontend, in case Gift Card Product selects this template. By selecting “Yes” in this section, you can allow customers to choose their favourable stock to print on the gift card. In vice versa result for “No” option, admin just limits customers to choose an available image for gift cards. You can change the gift card’s title at this section. In the Font Family field: Admin can change fonts with some pre-installed fonts in this section, including Times-Roman, Helvetica and Courier. Admins can change the note flexibly. Gift Card Note can be displayed if the gift card’s design has a note part. Load From Exist Template: Admins can load existing templates to edit quickly by selecting a template in the list box, then select Load Template, the design of the selected template will be displayed in the Design Template section. 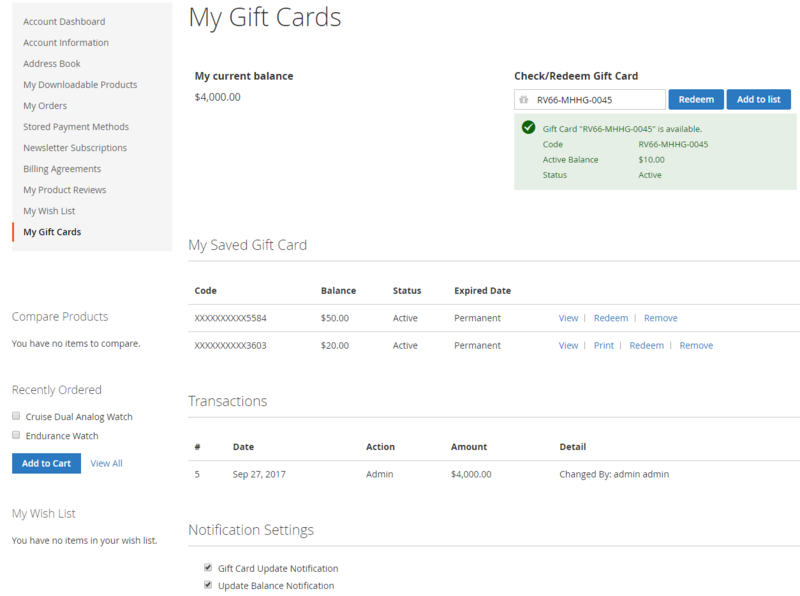 Admins can design the Gift Card template on this interface easily and quickly by dragging left items and dropping them in the empty box on the right. Admins will select some images as default images of gift cards by uploading or dragging images directly into the Upload Image box. 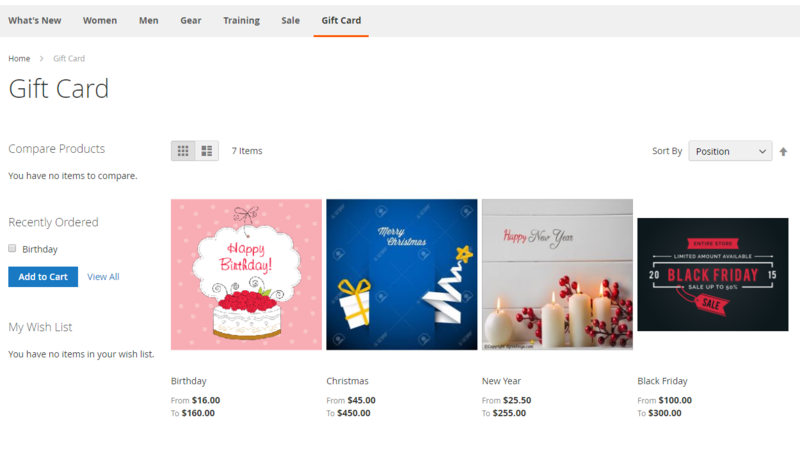 When the template is displayed on the Gift Card Product Page frontend, these images will also be displayed. Customers can choose different images to print different gift cards. This is the interface which archives all created gift codes. Delivery Date (indicates date the sender wants the Gift Card to be sent). Delete: check gift code(s) you want to remove, then choose the “Delete” in the Action box (at the left side of the Grid). Click “OK” to confirm the delete action. Change Status: check gift code(s) you want to apply, in the Action box select Change Status > Active/Inactive to change selected gift code(s) status. Only gift code(s) which has template can be printed out. After being sent, the Delivery’s mark color will be changed from red to green. 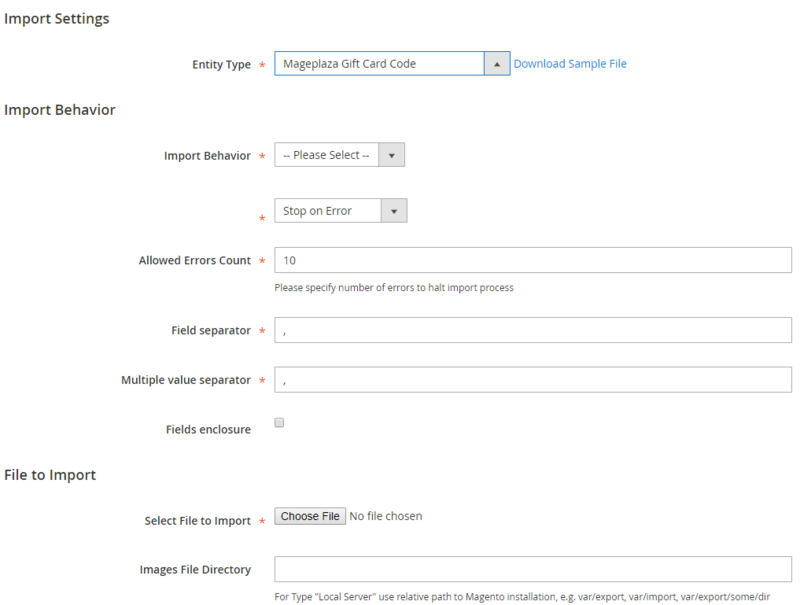 After accessing the Manage Gift Code(s) page, admins can select Create New Gift Code to create a new template. When click Save and Continue Edit, the page will automatically switch to the Edit Gift Code page, simultaneously display History and some other function buttons (Delete, Print). Will be taken from the General Configuration. Admins can change Code Pattern flexibly. This is where admins assign an amount to a gift card. This amount will be added to the gift credit when it’s redeemed and will be deducted from the order if Apply is setting as Discount. Choose “Active” to validate the gift code. The status will be changed to “Used” if the gift code is used. The status will be changed to “Inactive” if Balance is 0. The status will be changed to “Expired” when the gift card is out of date. The status will be change to “Cancelled” if its order is created a Credit Memo. In the Store field: The specific store view which a gift code is used. A website can have multiple store views. The gift code can only be used in the Store View which admins choose. In the Expires At field: Admin can set the expiration date for a gift code at here. Gift code can not be used if it’s overdue. In the Created At section: Only visible when gift code was created. It includes date and time creating. 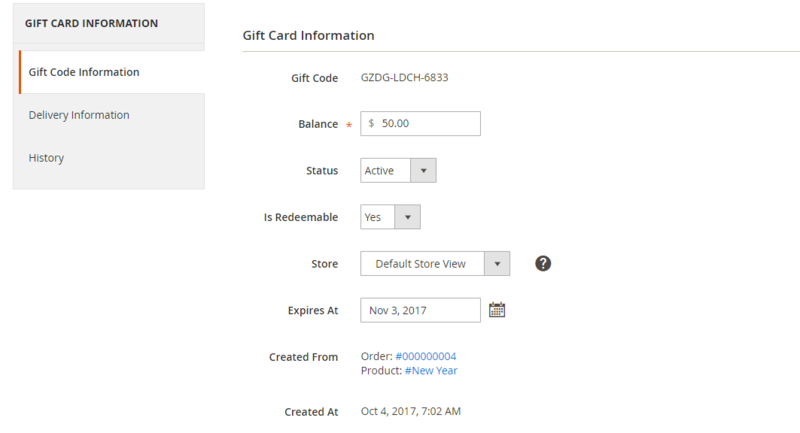 In the Created From field: This entry is only visible to gift codes created from the Order that contains the Gift Card Product, including the Order ID and the name of the Gift Card Product. 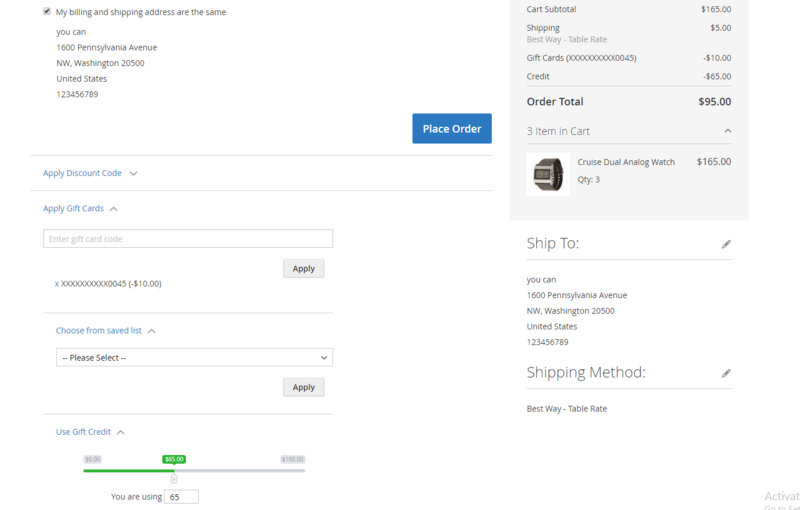 Modules in Delivery Information are automatically filled in if the gift code is created from an order that contains a Gift Card Product that the customer has filled out when making a purchase. However, you can also correct this information before sending a gift card to recipients. Follow these steps if you want to create a new gift code. In the Image field: This part is visible when the above Template is selected. Admins can change images to print on the gift card. The image that customers upload when buying Gift Card Product is also shown in this section. This sender name will be displayed when admins send gift cards, letting the recipient know who gifted this certificate. This recipient name will be used when sending a gift card. If the To section is included in gift cards, the recipient’s name will be displayed on the Gift Card. Includes 4 types of Delivery Method: Email, Text Message, Print At Home and Post Office. Gift Code Pool is a set of gift codes with the same information as Balance, Expiration Date, Template … Admins can create a Pool to issue a series of gift code quickly. Delete: check gift code pool(s) you want to remove, then choose the “Delete” in the Action box (at the left side of the Grid). Click “OK” to confirm the delete action. Change Status: check gift code pool(s) you want to apply, in the Action box select Change Status > Active/Inactive to change selected gift code pool(s) status. All the gift codes within the pool’s will be changed too. In the Name field: A friendly note that you need to name the gift code pool to distinguish easily from other pools. In the Status field: Choose “Active” to enable the pool . Includes the basic information of the gift card, you just need to fill in this information similarly to when creating a gift code. 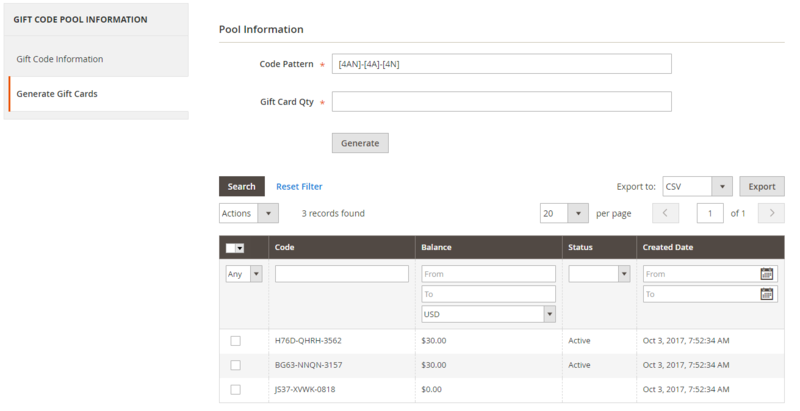 This module is only visible when Pool is created, which provides information about the Code, Balance, Status and Date created by the gift card. In the Code Pattern: Admins can change the code pattern of the pool. The created gift card will have the same gift code form. Gift Card History shows the history log of all Gift Cards, including ID, Code, Action, Balance, Amount Change, Status, Detail and Created Date. To delete the history of a gift card, make your way to Manage Gift Code section and delete the gift card, all its history will be also deleted. After filling in all required information of a Gift Card Product such as Name, SKU, Qty and Category (Gift Card), admins need to choose Gift Card Information to create a Gift Card Product. Gift Code Pattern: admins can change the configured Code Pattern as you wish. When customers buy a gift card product containing this gift code, the product will have the form according to the pattern with the one admin used. A gift card will be created when purchasing a gift card product, this product will be sent to the customer via email or SMS according to the way that customer selects. The gift card will be sent to the recipient with the same email (or phone number) that the customer entered when purchasing the gift card product. The gift card will be sent to the recipient with the same email that customer completed when purchasing their gift card product. A gift code generated by a gift card will automatically be added to the Saved Gift Card List of the customer with the same email as the gift card was sent to. The created gift card when purchasing a gift card product will be sent to customers via post. Allow Amount Range: choose “Yes” to allow the customer change Amount of a gift card in the restricted amount set up by the admin. Min Amount: can be configurable when Allow Amount Range = Yes. By setting a minimum amount for a gift card, customers can’t enter the lower amount than that Min Amount. If you leave it blank, the default number will be 0. Template: Templates are automatically added to this section. The selected template will be displayed in the frontend. The tab Gift Card shows you the day Gift Card Credit changed, its Action, the Balance after changing, the amount of change and changing’s Detail. You can add/remove Balance of a customer by entering a number into Change field the click Change. This is where the customer can check their gift card. This is the module stores all gift cards that the customer stored, also gives the basic information of a gift card such as Code, * Balance, Status, Expired Date and some other actions. Print: This button is only displayed when the gift card has Type = Print at home. When the customer clicks this button, they will receive a PDF containing a printed gift card. Redeem: Only visible when Admin > Configuration > Can Redeem = Yes. Customers can click this button to quickly transfer the Balance of Gift Card to their Balance of Gift Card Credit. Check the Gift Card Update Notification so that customers can receive email notification every time their gift card is updated. This is where all the Active Template Gift Cards ( which admin selected in the Backend) is stored. Amount of a gift card installed by the admin in the backend. Usually, a gift card has only 1 amount. 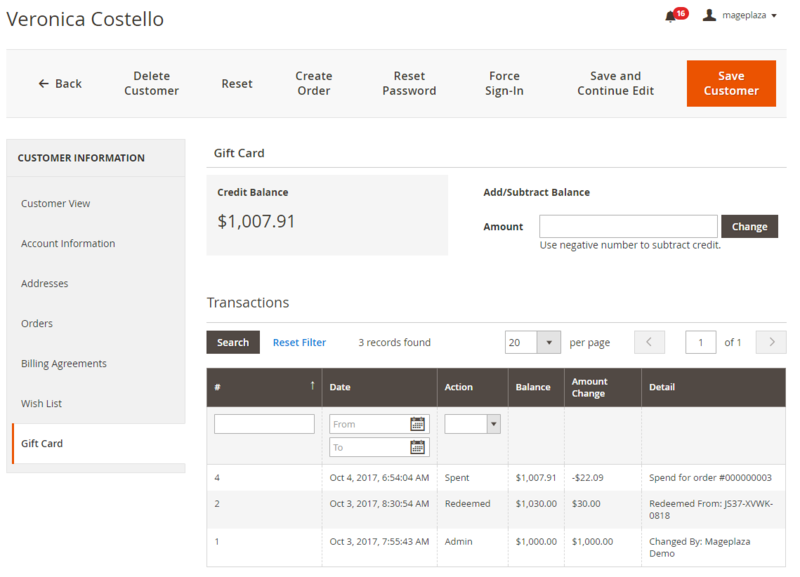 If a gift card has many amounts in the Backend, then customers has many Amount options. Also, when the admin has se tup Amount with Range settings, customers can change the amount according to its own within the given range. Email: Customers selects Delivery = Email, the gift card will be sent via email which was filled. Code: This is the column to fill Gift Card Code(s). The admin can enter any code as his wish. This is a required information. Balance: This is where you can enter the corresponding balance of each gift card. This is a required information. 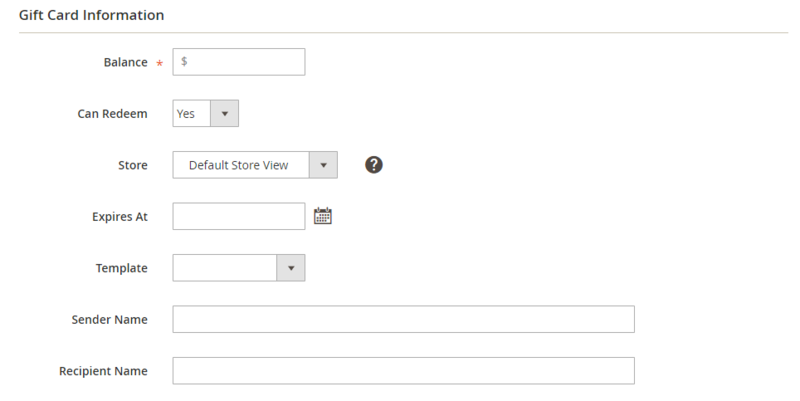 Store_id: corresponding to the Store View ID in Stores > Settings> All Stores. This is a required information. Now you can select a CSV file to import. Choose file you want to import. Clicking the Import button is the final steps! You should run the command: “bin/magento giftcard:uninstall” before you uninstall this extension so that your website doesn’t face the error.